Tanglewood in Lenox, Massachusetts, is the summer home of the Boston Symphony Orchestra (BSO) and the setting for a wide variety of musical performances each year. There's no better place in all of New England to spread out a picnic blanket, feast on gourmet goodies and listen to live music as the sun sets and the stars unveil themselves. 2018 marks Tanglewood's 81st season. James Taylor returns to his beloved Tanglewood once again on the 3rd and 4th of July. The Independence Day concert will be followed by fireworks. (July 3 and 4) Other popular artists who will take the Tanglewood stage in 2018 include: David Crosby (June 16), Stephen Stills and Judy Collins (June 17), Alison Krauss (June 19), Andy Grammer (June 22), Bela Fleck and the Flecktones (June 29), Ry Cooder and Emmylou Harris (July 1) and Peter Frampton with the Steve Miller Band (July 2). The Boston Symphony Orchestra's Tanglewood season officially opens with Music Director Andris Nelsons conducting Mozart's Overture to The Magic Flute and Piano Concerto No. 24 in C minor featuring pianist Lang Lang, plus Tchaikovsky's Symphony No. 5. (July 6) Nelsons, in a continued commitment to Tanglewood, will conduct more than a dozen programs over the course of the summer season including an all-Bernstein program (August 18): one of several events honoring the centennial of Leonard Bernstein's birth. Other highlights of BERNSTEIN CENTENNIAL SUMMER—CELEBRATING LENNY AT TANGLEWOOD! include a semi-staged performance of On the Town featuring singers with the Boston Pops Orchestra (July 7), a semi-staged performance of Trouble in Tahiti (July 12), a performance by the Boston Symphony Orchestra of Bernstein's iconic West Side Story score along with a screening of the film (July 28), a fully staged chamber ensemble performance of Bernstein's final theatrical work, A Quiet Place (August 9), two fully staged performances of Bernstein's comic operetta Candide (August 22 and 23) and a gala Bernstein Centennial Celebration (August 25) hosted by vocalist Audra McDonald. Bernstein fans will want to review the complete guide to the legendary composer and conductor's works that will be performed at Tanglewood this summer. The first BSO program conducted by Bernstein will also be recreated this season. The Tanglewood Music Center Orchestra with Nelsons conducting will play the Leonard Bernstein Memorial Concert featuring cellist Yo-Yo Ma (August 19). Ma will also join special guests at the Bernstein Centennial Celebration (August 25). Check the complete Tanglewood 2018 schedule for other fabulous performances, then purchase your tickets, compare rates at nearby hotels, pack your picnic, and head for Tanglewood. Tanglewood, located in the Berkshire hills of western Massachusetts, had its beginnings in 1936 when the BSO gave its first outdoor concerts in the area, a three-concert series held under a tent for a total crowd of 15,000. In 1937, the BSO returned to the Berkshires for an all-Beethoven program, but this time at Tanglewood, the 210-acre estate donated by the Tappan family, initiating a new era in the history of the American summer music festival. In 1938, the 5,100-seat Shed was inaugurated, giving the BSO a permanent, open-air structure in which to perform at Tanglewood. The Boston Symphony Orchestra has performed in the Koussevitzky Music Shed every summer since, except for the war years 1942-45, and Tanglewood has become a place of pilgrimage for millions of concertgoers. The 1986 acquisition of the Highwood estate next to Tanglewood increased the festival's public grounds by 40 percent and allowed for the construction of Seiji Ozawa Hall, which opened in 1994 along with the Leonard Bernstein Campus, which became the center for most Tanglewood Music Center activities. Ozawa Hall serves not only as a performance home for the Tanglewood Music Center but as a modern venue for the BSO's varied recital and chamber music offerings. 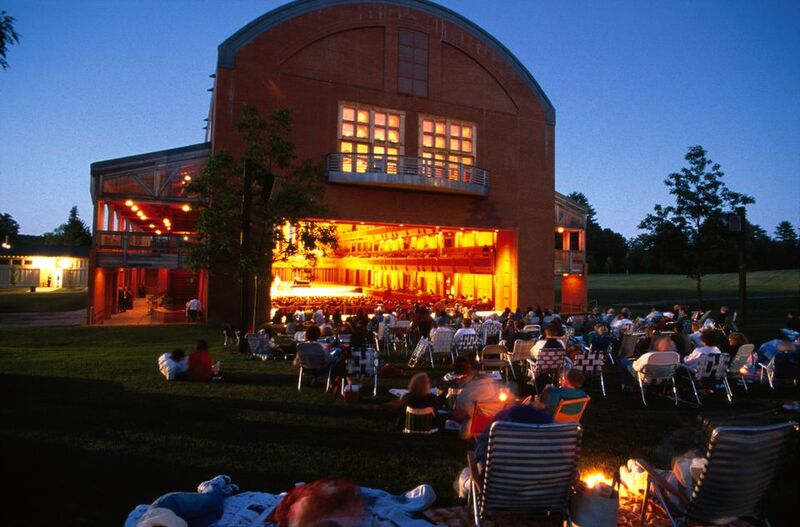 Tanglewood annually attracts more than 300,000 visitors for orchestral and chamber music concerts, instrumental and vocal recitals, student performances and the annual Festival of Contemporary Music, as well as performances by popular and jazz artists. The season offers not only a vast quantity of music​ but also a vast range of musical forms and styles, all of it presented with a regard for artistic excellence that makes the festival unique. In 2012, Tanglewood celebrated its 75th anniversary, and the season began with the same program that launched the venue on August 5, 1937: an all-Beethoven program. BSO Music Director Andris Nelsons will lead 13 Tanglewood programs during the summer of 2018, his fourth season.